Austin's Proposition 1, a ride-hailing ordinance supported by Uber and Lyft was defeated Saturday. With all precincts reporting late Saturday night, 48,673 voted against the ordinance and 38,539 voted for it. Lyft spokeswoman Chelsea Wilson said in an emailed statement that her company will "pause" operations in Austin beginning Monday. Uber said earlier Saturday that it would do the same if the ordinance was defeated. Former Austin City Council member Laura Morrison has been a staunch opponent of Proposition 1, speaking on behalf of Our City, Our Safety, Our Choice, a group opposed to the ordinance. She said Saturday's election results were Austin's way of saying, "that's not how we do democracy in this city." "I think that an attitude of 'my way or the highway' is just not really effective and does not appeal to the people of Austin," she said. "I don't know that there's much appetite on the council, now that Uber and Lyft made it a win, lose proposition, to start negotiating." Uber and Lyft have dumped more than $8 million into a campaign supporting Proposition 1, sponsoring glossy mailers, television ads and free rides to the polls. The relentless campaigning is a symptom of six months of sparring between the city and the ride-hailing companies. But the battle didn't start that way. At first, Uber and Lyft would speak at council meetings, urging the city to reconsider increasing ride-hailing regulations. The tipping point came in December, when the City Council passed an ordinance requiring drivers for ride-hailing companies to submit to fingerprint background checks, a stipulation that applies to taxi companies in the city. After the vote, supporters of Uber and Lyft sprung into action, amassing more than 25,000 certified signatures on a petition supporting an ordinance with weaker regulations. Per city code, the Ridesharing Works petition forced the City Council to adopt the proposal or call a special election and bring the matter to voters. The Council opted to hold an election — one the city clerk estimated could cost upwards of $500,000. The ballot asked voters to consider Proposition 1 and whether the city's existing ordinance should be axed and replaced with one that would "prohibit required fingerprinting, repeal the requirement to identify the vehicles with a distinctive emblem" and "repeal the prohibition against loading and unloading passengers in a travel lane." Both Uber and Lyft said they plan to cease their Austin operations if the election does not go in their favor. Austin Mayor Steve Adler said he hopes to sit down with Uber and Lyft following the election. "The people have spoken tonight loud and clear," he said in a statement Saturday. "Uber and Lyft are welcome to stay in Austin, and I invite them to the table regardless. Austin is an innovative and creative city, and we'll need to be at our most creative and innovative now." Rick Claypool, research director for Public Citizen, a consumer watchdog group, said the clash in Austin is unique because the city's special election is the first time a proposal backed by Uber has actually gone to voters. Claypool said the city will serve as an "object lesson" for other cities and could cause a "chilling effect" for those considering regulations. "Likewise, there are probably going to be cities that go out of their way to sort of lower the floor of requirements for companies," Claypool said. "They'll say, 'Come here, we're Uber-friendly. We won't make you do those things that those uncooperative places make you do.'" Supporters of Uber and Lyft have argued background checks regulations from cities are redundant, as ride-hailing companies have their own safety procedures already in place. "The $8 million [spent on campaigning] would have easily paid for the fingerprint-based background check," said Huey Rey Fischer, deputy outreach director for Ridesharing Works. "The problem is that fingerprinting is flawed in so many other respects, whether it's discriminatory against people of color or the fact that not enough drivers would actually sign up to meet demand, which is the greater reason." 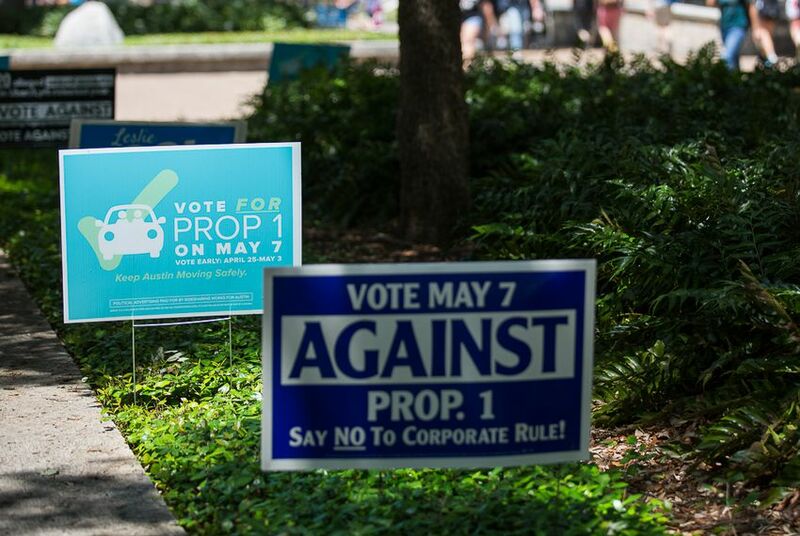 Opponents of Proposition 1 insist city-regulated checks are safer, and they see Uber and Lyft's aggressive campaigning as bullying, insisting the company is using "misleading" advertising to bend the city to its will. "We, unlike Uber and Lyft, do not have access to millions of dollars," said Austin Mayor Pro-Tem Kathie Tovo during a press conference in April. "Uber and Lyft are running a deceptive campaign in a blatant attempt to confuse the voters and allow corporations to write their own rules. These misleading campaign ads are simply reprehensible, and they're a huge disservice to our community." The pro-Proposition 1 campaign has not gone uncontested. Uber was hit with a class-action lawsuit on Wednesday over "robo-text messages" the company distributed to customers. A complaint has also been filed with the Federal Communications Commission. Austin is far from the only front on which the two businesses have fought against regulation. They have pit themselves against local governing bodies both in Texas and across the country and have carried through on their threat to leave cities with unfriendly regulations, ceasing operations in Galveston, Midland and Corpus Christi. This conflict also is coming to a head in Houston, one of two cities in the country where Uber remains despite existing fingerprint background check directives. Lyft closed up shop when the new regulations went into effect, leaving Uber alone in the city's ride-hailing industry — but perhaps not for much longer. In April, the company threatened to leave Houston if the city did not repeal its regulations.